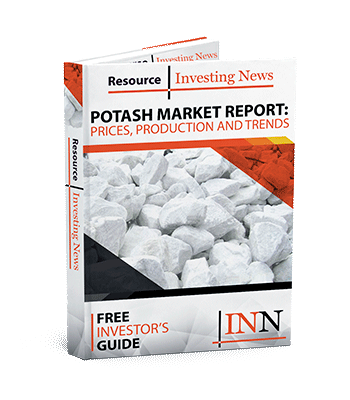 Wondering which potash companies to invest in? This list includes overviews of both small and large potash companies listed on the TSX and TSXV. The potash space was dominated by Russia’s Uralkali (MCX:URKA) and Belarusian Potash Company until the pair broke off their alliance in July 2013. The market has faced difficulties since then, with prices and stocks dropping, and potash companies have become resourceful as they try to stay afloat. Some have made forays into the cannabis industry, and some have jumped ship to join the booming blockchain space. Even so, a fair number of potash producers have managed to stay in business, and exploration companies continue to develop projects in preparation for a market upturn. With that in mind, we’ve put together a list of potash companies listed on the TSX and TSXV; all had market caps of at least C$10 million at the time of publication. Let us know in the comments if we’ve missed a stock you think should be included. And if you want to learn more about potash companies, you can read our article on ASX-listed potash companies. This firm produces a variety of different materials, but in terms of potash it has over 20 million tonnes of capacity at its six potash mines in Saskatchewan. Western Resources is a development-stage potash company working to build a solution mine at its Milestone project in Saskatchewan. In 2017, the company signed a letter of intent (LOI) with China BlueChemical regarding an offtake agreement for Milestone. Milestone is close to Mosaic’s (NYSE:MOS) Belle Plaine mine, which is one of the largest producing potash solution mines in the world. Since then, the company has received environmental assessment approval for Phase I development at Milestone. It has also entered into a project agreement for Milestone with the rural municipality of Lajord, and has renegotiated a water supply agreement for the operation with the city of Regina. In June 2018, the company awarded a contract for the final stage of Phase I project engineering at Milestone. Verde AgriTech bills itself as an agri-tech company focused on developing innovative products that promote sustainable agriculture. Its main asset is its Cerrado Verde project, which holds a potassium-rich deposit and is located in the heart of Brazil’s largest agricultural market. Production began at Cerrado Verde in May 2017, and the company exported its first shipment of Super Greensand™ to US cannabis and organic markets at the same time. Super Greensand™ is a fertilizer and soil conditioner; as a fertilizer it provides potassium, magnesium, silicon, iron and manganese, and as a soil conditioner it increases the capacity of soil to retain water and nutrients. In March 2018, Verde received environmental licenses for mining 150,000 tons of its Super Greensand™ per year. The company also launched a new product in 2018; it is called Super Greensand Granular ™. Potash Ridge is an exploration and development company with assets in Utah and Quebec. One of its main asset is its Utah-based Blawn Mountain sulfate of potash (SOP) project. Potash Ridge secured a mining lease for Blawn Mountain in July and in April 2018 signed an offtake memorandum of understanding for SOP from the asset. The company’s other key property is its Valleyfield SOP project in Quebec. In June of last year, it engaged Novopro Projects to advance the project through final engineering and construction; the same month, Potash Ridge announced an offtake agreement that represents about 25 percent of initial annual production from Valleyfield. Since then, Potash Ridge has determined that it is in its best interest to spin out Valleyfield. It tried to arrange a deal with Canada Coal (TSXV:CCK), but ultimately was unsuccessful. Crystal Peak Minerals controls over 124,000 acres in Utah’s Sevier playa, and intends to produce SOP and other beneficial minerals. It released a preliminary feasibility study for its Sevier Lake project in 2013. In June 2017, it completed a $12-million financing with EMR Capital Investment, commenting that it would use the funds to continue to develop Sevier Lake. So far 2018 has been a quiet year for Crystal Peak. In July, the company entered into a convertible loan agreement with EMR Capital Resources Fund 1. The loan will be delivered in two tranches and will total US$10 million. Gensource Potash is taking a different approach to breaking into the potash industry as a new producer. Until now, the entry point for becoming a producer was a project that took seven to 10 years to develop, cost in the range of $4 billion to construct, operated at a cash cost of about $70 per tonne and produced 3, expanding to 4, million tonnes of product per year. It believes that because of these barriers to entry and the market risk created by the existing potash producers, there have been no true new producers in the industry in many decades. The company has now created a new entry point based on up-to-date solution mining and processing methods. The new entry point is small, but easily scalable. It can start as low as 250,000 tonnes a year of production, costs just $279 million to construct and takes less than two years to first production. Further, it is forecast to operate at a cash cost of just $53 per tonne and, importantly, creates no salt tailings on surface, setting a new environmental bar for the industry. This is an updated version of an article originally published by the Investing News Network in 2015.